The Book Chook: Let's Celebrate Save the Frogs Day! Let's Celebrate Save the Frogs Day! April 28 2012 is the 4th Annual Save the Frogs Day. Why do we need to save frogs? Are they in danger? "Frogs are the most threatened group of animals on the planet, and are rapidly going extinct. Nearly one-third of the world's 6,644 amphibian species are in danger of extinction and up to 200 species have completely disappeared in the last 30 years." And by saving frogs, we may in fact be saving ourselves. As Dr Kerry Kriger, Founder & Executive Director of SAVE THE FROGS!, said on Save The Frogs Day, April 29 2011, "When we save the frogs, we’re protecting all our wildlife, all our ecosystems and all humans." What can we actually do to help save frogs? I asked Penny Whitehouse, Zoo Keeper and Wildlife Education Officer, who blogs at WildlifeFun4Kids, if she could give us some advice. Build your own frog pond! The best and only way to save wildlife is to help provide them with a place to live and reproduce. If we can bring wildlife habitat to our backyards they are more likely to survive. There are plenty of resources available to help you build a frog-specific pond. We don’t really want to encourage toads to your backyard, especially if you have pets, so making sure you research your frog pond is a must. Much of the chemicals we use in and around our homes end up washed into our waterways and hence frog habitat. Many studies have shown that pesticides have a negative effect on frogs causing, immunosuppression, hermaphroditism, delayed metamorphosis and of course killing frogs. We can help by using natural cleaning products and pesticides around our house. There are heaps of alternatives, like using chilli powder on your vegetable plants to stop bugs and tipping boiling water on grass and weeds you want to die (it breaks down the plant cell walls). It’s natural for our pets to hunt so it’s important we, as good pet owners, reduce the risk of wildlife being killed by them. We can do this by keeping our pets indoors from 4pm to 7am. If this routine starts from a young age, rarely do pets have an issue with being kept inside. Enrichment such as boomer balls, scatter feeds and frozen popsicles with a treat inside are an easy ways to transition a pet into becoming indoor animals. If you find a frog and need to move it, try to use something other than your hand to pick it up. The oils and soaps on our hands seep through their skin and can make frogs very sick or even kill them. If you only have your hand, make sure you wash them well with water – no soap . Keep your hands wet and quickly move the frog to another location. It’s always better to act for frogs by using the tips above, but if you don’t have pets or a backyard for a frog pond think about donating to Save the Frog Foundation. Their pledge “We promise to convert your hard-earned dollars into time-tested, proven amphibian conservation actions that spread amphibian awareness to the farthest corners of the planet”. Donate here. Want to know more ways to help frogs? The Save the Frog website has heaps of ways you can do it! *Look at eggs, tadpoles and frogs and see if you can record some facts about the lifecycle of frogs. If it's not too cold where you live, visit a local creek or stream with your kids and try to catch a tadpole. Take it home and put it in an old fish aquarium and track the changes as it grows. Recording those changes with your camera would make an interesting project. Lettuce is something tadpoles will eat. Remember we're saving frogs and return the fully grown frog to his original habitat. The Frogs Australia Network has excellent information on tips and regulations for keeping frogs and tadpoles. *Why not make a poster about our froggy friends? You could use an online Poster maker like Big Huge Labs Motivator, or draw/paint your own frogs onto paper or canvas. 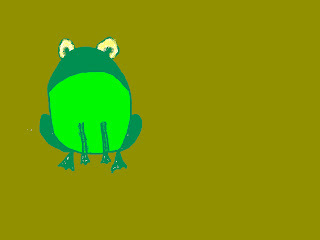 I found a frog drawing tutorial and followed it to make my wonderful frog above. *Consider submitting froggy art work to the Save the Frogs Art contest. Get inspiration from the video below. *Check out your local and school library's books about amphibians, frogs in particular. Said he, "I'll get wet and I might catch a cold." Da-glook went the little green frog. "La de da de da"
They don't go glook, glook, glook! *Watch Kermit singing It's Not Easy Being Green. *Bake a frog cake, or add some lolly frogs to green jelly. More suggestions from Penny, including the cutest frog mask! • Sing another song, Five Green and Speckled Frogs. Kate at Picklebums has a great frog printable for this. 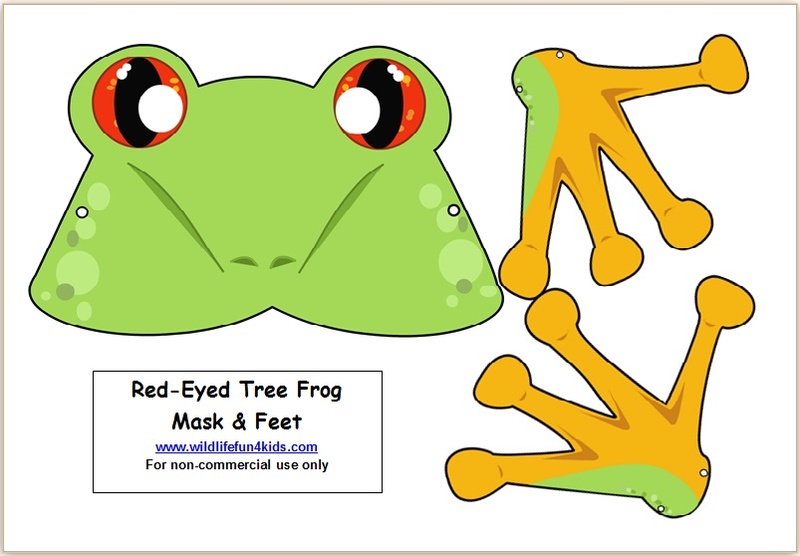 • Hop over to WildlifeFun4Kids to download this froggy mask and feet (pictured just above), perfect for role-playing with songs. • Write a frog story. What will you call your frog? Where does it live? • Have a chocolate frog hunt. Thanks so much Penny! Have a happy Save the Frogs Day, everyone! We're doing our part to save the frogs! Our little pond now has a gazillion tadpoles. Boy those frogs are noisy when they mate. @Kim McDougall Counting them must have been tricky!